Despite the emergence of fragile democracies in Latin America in the 1980s, a legacy of fear and repression haunts this region. 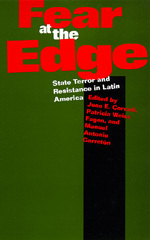 This provocative volume chronicles the effect of systematic state terror on the social fabric in Chile, Argentina, Brazil, and Uruguay from the 1960s to the mid-1980s. The contributors, primarily Latin American scholars, examine the deep sense of insecurity and the complex social psychology of people who live in authoritarian regimes. There is Argentina, where the brutal repression of the 1976 coup almost completely smothered individuals who might once have opposed government practices, and Uruguay, where the government forced the population into neutrality and isolation and cast a silent pall on everyday life. Accounts of repression and resistance in Chile and Brazil are also vividly presented. The denial and rationalization by citizens in all four countries can only be understood in the context of the generalized fear and confusion created by the violent military campaigns, which included abductions, torture, and disappearances of alleged terrorists. The recent transition to civilian rule in these countries has spotlighted their powerful legacy of fear. These important essays reveal disturbing insights into how fear is generated, legitimized, accommodated, and resisted among people living under totalitarian rule. Juan E. Corradi is Professor of Sociology at New York University and the author of The Fitful Republic: Economy, Society, and Politics in Argentina (1985). Patricia Weiss Fagen works for the United Nations High Commission for Refugees in El Salvador and is the author of Exiles and Citizens: Spanish Republicans in Mexico (1973). Manuel Antonio Garretón is a member of the Latin American Faculty of Social Sciences in Santiago, Chile.